The sad truth is that many would simply scoff at the mere notion of needing to be terrified at the majesty of God. In the modern day purpose driven church, such notions are anathema. When we are not trying to ascend to the throne of the Most High we can usually be found trying to drag God down to the level of man. The "I am a friend of God" theology makes God our wingman. There was actually a sermon preached last month in a mega church about Jesus being our wingman. Terrified of His majesty? Please. So it is of little wonder that a people who are so poorly taught about who God is think they have to lie for Him. That they need to destroy people in the name of Jesus. 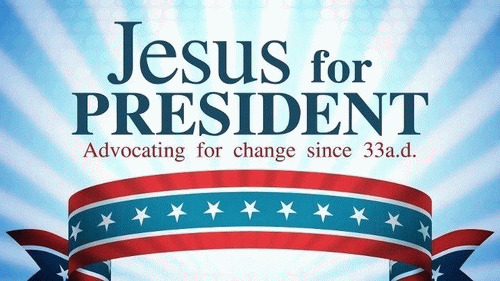 What does it say when we claim to serve a God that is omnipotent but think He needs an assist with the elections? It says we are people of little to no faith. Do you think God is not in control beloved? Do you think the prospect of President Trump or President Hillary scares God? Have we considered that our choice is so poor this year is a sign of judgment? Not upon the world but upon the church. The same church that sided with the Mormon cult member the last time. The same church that is more concerned with reviving Sodom than preaching the coming kingdom. It is time we wake up as Christians and stand up for the only thing that matters -- the Gospel. In order to do that we need to remove some carnal misperceptions being offered by many in Christian "leadership" in pursuit of their carnal dreams of who they want as President. Let us start with the simple fact that God will not be reviewing our voting record. I am almost embarrassed to have to point this out but I have seen the most absurd things from Christians who think that when we stand before Christ He is going to say, "Hey, I would like to let you into everlasting glory but"Clinton in 96, C'mon!" It doesn't work that way beloved. God does not care who is the next king of Sodom. He will use whoever He wants to and whoever He needs to. He used Nebuchadnezzar and Cyrus. He used the Assyrian savages and the Roman Empire. Maybe we forget this but today's deep theology is this -- He is God. All by Himself. All alone. He needs no help. So as Christians we live in a pagan nation. Each election we are given two choices and we essentially play the lesser of two evils game. We should pray and vote as led to understanding that our brother or sister may have felt led to vote the other way. Neither is right nor wrong. Why? Because He is God. He can and will handle whatever happens and whoever is in office. We should never lose sight of the fact that the lesser of two evils is still evil. God is not going to care about our carnal wisdom in why we feel this one or that is less evil. We should never be caught defending nor advocating for evil. The Bible says woe to he who calls evil good. That is what we do when we insist on supporting and defending either candidate as the Christian choice. Wait a minute preacher! Are you saying we should not be trying to influence our society? The simple answer is yes and no. The way the church has gone about trying to influence society and culture is simply unbiblical. Jesus did not spend His ministry days trying to change the Roman Empire. His days were spent on one thing and one thing alone -- the Gospel. Why? Because only the Gospel has the power of God unto the salvation of man. Translation? Only the Gospel of Jesus Christ can save someone from hell. Not Hillary or the Donald. Not the Republican Party nor the Democrats. Not the elimination of abortion or the halting of LGBTQI rights. I know Christian leaders who spend their entire "ministry" on trying to influence politics and elections. When they stand before Christ they will do so empty handed. They did not preach the Gospel and therefore no one was led to the cross. They were not doing the will of God. Every breath we waste as Christians and Christian leaders in this election is one that was not spent on preaching the Gospel. So why do we love spending so much energy on things that are not of God? This is the end of the story of Abram and Lot separating. We see Lot pitches his tent towards wickedness. He pitches it towards Sodom. The next time we come back to Lot in this story he is living in Sodom. The attraction of wickedness to our flesh is often overwhelming. There was no rehabilitating Sodom. There was no hope for revival. There was no belief that if they just elected the right leaders and politicians, then Sodom could become godly. Yet that is what we are led to believe by the church today. That America, which is at least the wicked equivalent to Sodom, can be saved. That if the right man gets into the White House then maybe we can revive the country. We do we so deceive ourselves? Here is the hard lesson for today. We like Sodom. Our flesh craves the sin and excess of Sodom. Sure maybe we start by merely pitching our tents towards it. Maybe just skirt around the perimeter to see what we are missing. Maybe we can avoid the siren call for a while but eventually we will be found living in Sodom. Defending Sodom. Advocating for Sodom. Finding Christianese to slap some makeshift piety on it. Lying to defend God. Showing partiality to evil. My candidate is chosen by God. Right. So what then was the "yes" portion of that answer? Well, I do believe that Christianity should have an effect on culture and society. The problem is we keep thinking it is all about us when it is really all about Him. We keep looking to carnal men and women, who do not even know God, to be the change agent we are hoping for in society. Only the Gospel is the real change agent. Only the Gospel can bring a sinner to repentance. Not a conservative or a liberal. Neither a peacenik nor a war hawk. The church is supposed to represent the Gospel to the lost. Let us reason together beloved as we look at the key verses today. This is the Great Commission given to us by our Lord and Savior. As always, the Word provides our answers. So what did Jesus charge us with? There are essentially three steps to our orders and they are sequential, not random. We are supposed to make disciples, baptize them, and then teach them correct doctrine. It seems the church today has things out of order. They have taken the instruction to teach correct doctrine and placed it first, before making disciples. Think about it. When we rail against the world that they should be pro-life because God knew us in our womb we forget that is utter foolishness to those who are perishing! It is like trying to teach a blind man to drive and getting angry when he keeps driving off the road. These three imperatives in the Great Commission are in this order for a reason. You first must deal with the spiritual blindness before you ever hope to teach them how to drive. So how then do we make disciples? The first part of our orders. Is it by telling people who to vote for? Is it by marching in pro-life parades? Is it by screaming at sinners things they do not believe and could not possibly understand? How about trying to lobby for legislation? Trying to overturn the Johnson Amendment so preachers can take political sides without fear of losing their tax exempt status? Surprisingly no. None of these things makes disciples. A disciple is a follower of Jesus Christ and the only way to become a follower is to hear the Gospel. To hear that He died for our sins. To hear that He defeated death and rose on the third day. To then be drawn by the Holy Spirit and become born again of that same Spirit. It is not a political process. It has absolutely nothing to do with the carnality of this world and our politics. Then we move to step two and the newly saved person declares their faith in their new Lord and Savior and buries their old man/woman to be resurrected in Christ Jesus. It is only then can we move onto to trying to educate them as to the things of Christ. What can people say if they see our Twitter feed or Facebook homepage? In the short time we have been given are we trying to persuade people that Trump is righteous or that Hillary is the Christian choice. Or are we trying to make disciples first? Screaming at the unsaved is not discipleship. Calling the unsaved "sinners" is not discipleship. The Bible describes us as pilgrims and sojourners in this world. We are just supposed to be traveling through because our citizenship is in heaven. We were not supposed to pitch our tents towards Sodom and fall in love with its excess and sin. We were not supposed to use the precious moments we have in front of King Agrippa to state our case for increased defense spending, eliminating national healthcare or which lesser evil must be elected for the continuation of our "way of life." Instead we ought to leave our homes each day thinking that we want everyone who is within earshot of us that day to come to penitent faith in Jesus Christ for the forgiveness of their sins. Not that everyone who hears us will know how much we hate Hillary or think Trump is the embodiment of evil. We should want everyone who visits our Facebook page or follows us on Twitter to feel as Agrippa did that day that we are trying to persuade them to consider this Gospel message. The only message that can truly save a soul for all eternity. If they choose to ignore the message they continue down the broad path with seeds planted for further growth. If they do not ignore it however"hallelujah! If they move onto step two and declare Christ as their Lord and Savior we can finally get to explaining doctrine. Teaching all that Jesus has commanded. The newly indwelt Holy Spirit can guide them into all truth and they too can then go out in search of the next Agrippa. Beloved, we do not truly influence society and culture other than living Christlike in a decidedly un-Christlike world. We influence society and culture by declaring the only thing that can save them -- the Gospel of Jesus Christ. I have been accused of favoring one candidate over another. This accusation is born out of a carnal view of secular politics. I have consistently said that Christians should look to no man to solve their problems and only to God. I have said consistently that Christians need to stop with the Chicken Little faithlessness that screams the sky is falling every time they do not get their way. Either God is in control or He is not. He is either who He said He was or He is a liar. It does not matter eternally if Gary Johnson gets elected this year. We will all wake up on November 9, 2016 with this reality -- God will still be on the throne. It is high time we started acting like it. We have to decide as people who claim to follow Christ if we are interested in saving Sodom or saving people. If it is the latter then it is time to stop preaching politics and get back to the only thing that can save anyone -- the Gospel. Just as a closing word about truth. We are supposed to stand for the truth as Christians. Our witness for Christ is damaged whenever the world sees we are lying or supporting deceitfulness, whatever our motive may be. The Job verses prove that God does not need nor want any of our lies for His behalf. So I will stand against any and all lies, from Christians and those espousing to represent Christ. Not from the world beloved. I expect them to lie. Christians are not supposed to be the hypocrites the world rightly sees them as. Daniel never lied to Nebuchadnezzar. Jesus never lied to Pontius Pilate. Paul did not lie to King Agrippa. All three of these rulers, like the thousands that litter the pages of history are mere footnotes to God. Donald Trump or Hillary Clinton will be no different. It is time we started acting like we believe that.